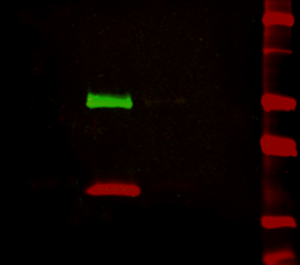 Fluorescent Western blotting can offer many advantages to an already robust protein detection technique. Secondary Antibodies are conjugated to a fluorescent dye such as an Alexa Fluor® to generate signal which can be detected using a digital imager. The technique is highly sensitive, can be used quantitatively and allows for multiplex detection on the same blot without stripping and reprobing. Like colorimetric and chemiluminescent Western blotting, fluorescent Western blotting uses the antigen-antibody complex to detect specific proteins immobilized on a blotting membrane after separation by electrophoresis. Visualization of the protein is achieved by exciting the fluorescent dye using an imaging system equipped with an appropriate light source. The fluorescent dye absorbs light at its excitation wavelength, and then releases photons at its emission wavelength to return the molecule to its ground electronic state. The light emitted by the fluorescent molecule (fluorophore) is then detected by a digital imager equipped with the correct filters. Figure 1: Indirect Fluorescent detection. A. Fluorescent dye-conjugated secondary antibody detects the primary antibody for the protein of interest. B. Light is used to excite the fluorescent conjugate at its excitation wavelength. C. The excited fluorescent dye emits light at its emission wavelength which is detected via a digital imager, allowing visualization of the protein of interest. Fluorescent Western blotting offers a number advantages over chemiluminescent and colorimetric detection. Multiplex detection – detecting multiple proteins on a single blot. Fluorescent blotting makes multiplex Western blot analysis easily achievable, as multiple proteins can be simultaneously detected and differentiated on the same blot. Dye conjugated secondary antibodies directed against primaries raised in different species can be used to label each specific antigen (protein) with a dye with its own individual emission wavelength – spectral characteristics. The spectrally distinct dyes are excited by the digital imager and emit light at their signature wavelengths, allowing two or three different proteins to be detected on the same blot (Figure 2). This offers advantages over chemiluminescent and colorimetric detection, which require stripping and reprobing the blot when looking at multiple targets. Fluorescent detection allows the blots to be used quantitatively because proteins on the blot are not perturbed by harsh stripping chemicals. Another benefit is the visualization of proteins that are poorly resolved by electrophoresis, as proteins that are not well separated by size can be distinguished by color. Jackson ImmunoResearch offers fluorescent dye-conjugated secondary antibodies that have minimal cross-reactivity with selected species, enabling detection of individual primary antibodies (and therefore target proteins) without signal overlap. Figure 2: Multiplex detection of multiple protein targets without stripping and reprobing. Double immunofluorescence staining on a Western blot using Alexa Fluor® 680 far-red dye and Alexa Fluor® 790 infrared dye. Mouse IgG was reduced and denatured with β-mercaptoethanol and SDS. The heavy and light chains were separated by SDS-PAGE, transferred to nitrocellulose, and double labeled with a 1:100,000 dilution of Alexa Fluor® 790-Goat anti-Mouse IgG, Fcγ Subclass 1 specific (min X Hu, Bov, Rb Sr Prot, 115-655-205) (green) detecting heavy chains at 50 kDa and a 1:100,000 dilution of Alexa Fluor® 680-Goat anti-Mouse IgG, light chain specific (min X Bov, Gt, Hrs, Hu, Rb, Rat, Shp Ig, 115-625-174) (red) detecting light chains at 25 kDa). Fluorescence was imaged in a LiCor Odyssey imager. The amount of signal produced is proportional to the amount of protein present. When combined with a wide dynamic range, optimized fluorescent Western blots can be used quantitatively, since both low and high abundance proteins can be detected on the same blot without saturating detection. Far-red and infrared fluorescent dye conjugates such as Alexa Fluor® 680 and 790 (Figure 2) offer greater sensitivity due to low fluorescence quenching, high extinction coefficients and low background autofluorescence. They can be used for high sensitivity, quantitative and in-gel Western blotting as well as microWestern, in-cell and on-cell Western arrays and other techniques that require the brightest dyes. Due to good stability blots can potentially be archived and re-imaged. A very simple and quick immunotechnique that can be used for optimizing detection limits and the screening of numerous samples is the dot blot. When migration of an analyte has already been characterized, dot-blotting is a fast and simple way to screen multiple samples for presence of the protein of interest. The use of a grid system allows detection sensitivity to be ascertained without the variability of transfer in multiple Western blots. Using fluorescent dyes it is possible to confirm presence of one or more analytes in sample on the same blot. Figure 3: Fluorescent Dot blot. 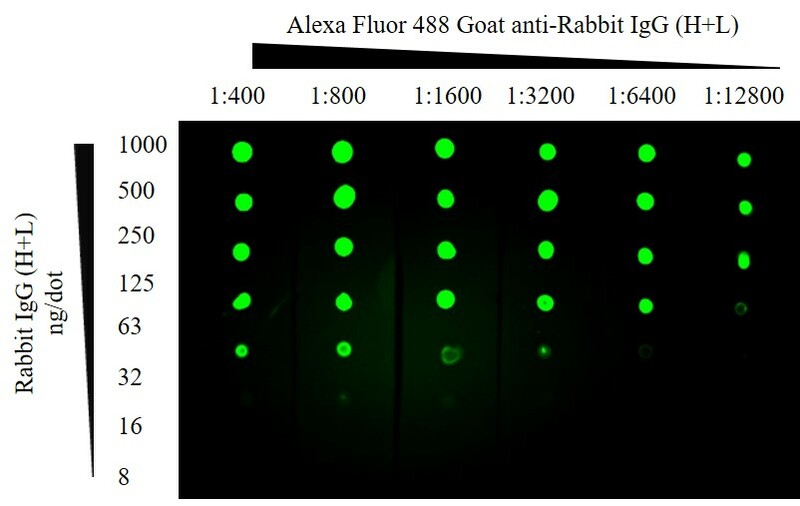 ChromPure Rabbit IgG (H+L) detected with Alexa Fluor® 488 Goat anti-Rabbit IgG (H+L). After application of protein the membrane was blocked using 5% Bovine Serum Albumin. 1 second exposure; filter 525; Blue LED module light; 3×3 binning. Table 1: Depending on the set-up of your digital imager fluorescent dyes ranging from ultraviolet to infrared may be compatible for use in fluorescent Western blotting. For multiplex detection it is important to select dyes that are spectrally distinct, with no overlapping spectra. Like chemiluminescent Western blotting, fluorescent blotting requires optimization to improve detection of signal over background noise. Background can come from materials used for blotting, so it is important to select materials that are do not have fluorescent properties. Polyacrylamide electrophoresis gels and blotting membranes (both nitrocellulose and PVDF) may have fluorescent properties which can cause significant background. Observe an unstained gel or membrane using various filter options available on the detection instrument, and if possible choose a fluorescent dye that emits light in a region where the membrane doesn’t autofluoresce. Low signal may be due to low antigen (due to low protein expression, degradation or overzealous washing of the blotting membrane), and subsequent fluorescent labeling will be low, even with the amplification benefits of a secondary antibody. Signal can also be reduced due to fluorescence quenching, whereby the signal is diminished by Förster resonance energy transfer (FRET), if the fluorescent labeling is too high. Digital imagers allow efficient optimization of detection conditions compared with chemiluminescent blotting, which requires repeated exposures to optimize.